Small details like handy wicker storage baskets and the distressed wood finish that begs to be touched helps this sofa table stand apart from the rest.The four drawers and two removable wicker baskets are perfect for helping get living room clutter under control, while the open shelf is an ideal spot for a decorative display. The Cottage Lane Casual Sofa Table with Removable Storage Baskets by Magnussen Home at Beck's Furniture in the Sacramento, Rancho Cordova, Roseville, California area. Product availability may vary. Contact us for the most current availability on this product. For you the home is a place of tradition and comfort, a cozy haven for you to relax with your family after a long day at work. 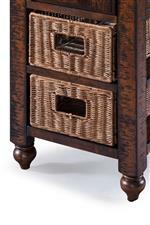 Tables from the Cottage Lane collection describe your tastes perfectly, with a laid-back, distressed wood finish and traditional touches like turned wood legs and woven wicker baskets. Cottage Lane effortlessly adds storage and display space to your living room with spacious drawers and removable storage baskets. A coffee table with lift-top make this collection a functional favorite for homes all across the country. The Cottage Lane collection is a great option if you are looking for Casual furniture in the Sacramento, Rancho Cordova, Roseville, California area. Browse other items in the Cottage Lane collection from Beck's Furniture in the Sacramento, Rancho Cordova, Roseville, California area.